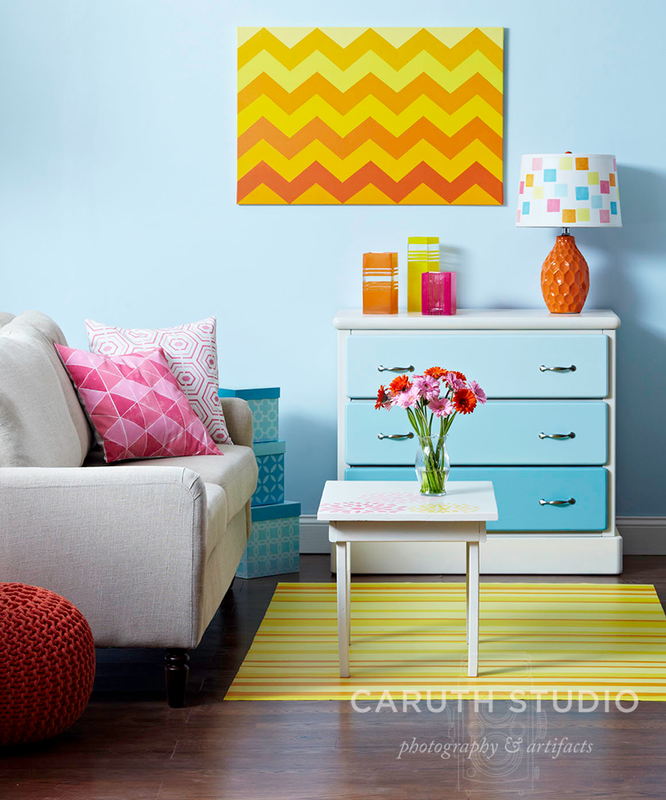 From sunny chevrons to sassy stenciled blooms, these decor accent paint projects are guaranteed to make you pattern happy. 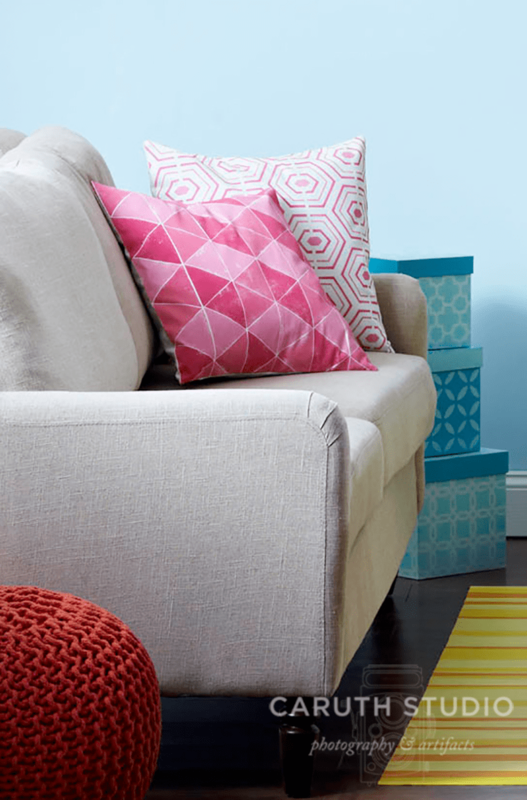 Bright without going neon, the fresh juicy colors used in this living room update will energize any environment. 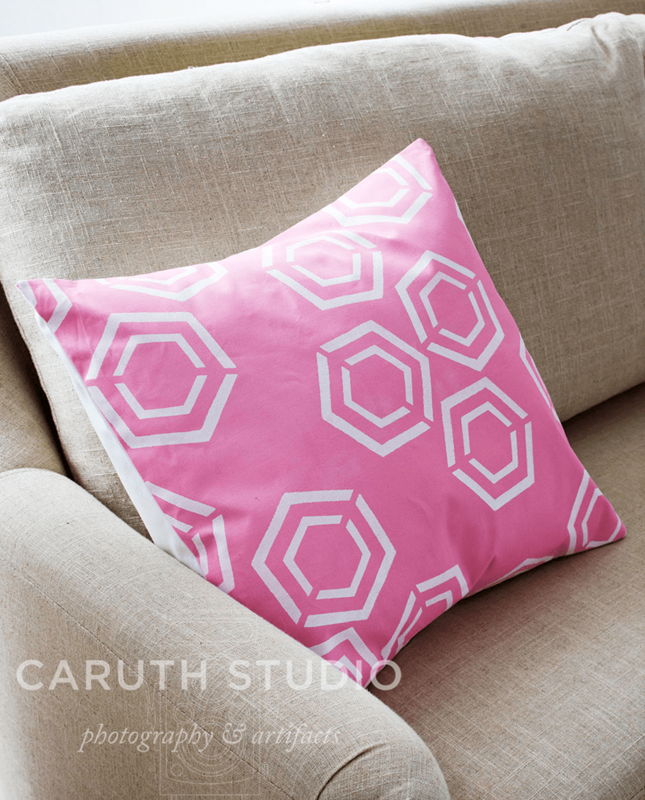 Pretty pink-and-white painted pillows get their fashionable flair from stamping (left) and stenciling (right). Get t free patterns at the bottom of the post! Place plastic sheeting inside pillow cover to keep paint from bleeding through the fabric and onto the backside of the cover. Place the pillow cover face up on the foam core and secure with wide masking tape. Stretch the fabric tightly as you tape each side. To make three stamps (one each for the light, medium, and dark pink tones) measure and mark six triangles on the crafts foam and cut out. Peel the paper backing off the crafts foam and stick to the plexiglass blocks, stacking two triangles on each block. Working with one color at a time, pour small amounts of each color paint onto a disposable plate. Into each puddle of paint add equal parts fabric painting medium and a few drops of water. Using the foam sponge, apply paint to the surface of the stamp. Press the stamp onto the fabric using firm pressure. Remove the stamp without sliding it. Stamp each triangle shape using the photo as a guide for color placement; let dry. 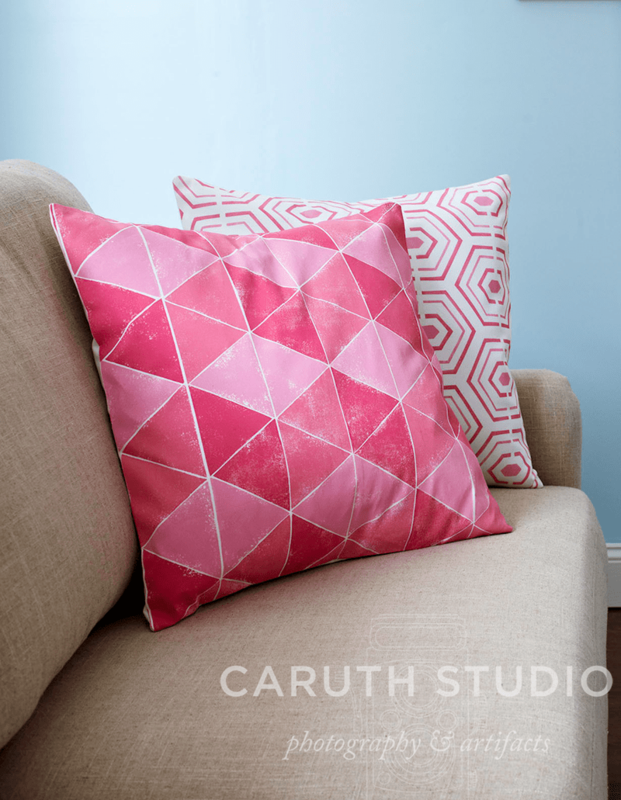 Use a fine-tip permanent marker to transfer the geometric design to the stencil plastic. Tape the plastic in place onto the self-healing cutting mat. Use the crafts knife to cut out each shape. Pour small amounts of light and medium paint onto the disposable plate. Mix equal parts of fabric painting medium into each paint puddle. Add a couple drops of water to each puddle of paint and medium mixture and mix well. Pick up a scant amount of light pink paint on a stencil brush. Tap the loaded brush onto a stack of absorbent paper towels. Too much paint on the brush can cause the paint to bleed under the stencil. Using light pressure, apply the paint to the stencil. Apply the medium pink paint. Check to make sure all stencil openings have been covered and fill in where necessary. Remove the stencil and let dry. Continue stenciling randomly placed designs as desired; let dry. In a small container, mix equal parts of light pink paint and fabric painting medium with a couple tsp. of water. Use a small foam roller to paint the entire pillow cover front with the light pink mixture; let dry. Pour a small amount of white paint onto the disposable plate and add an equal amount of fabric painting medium plus a few drops of water. Pick up a scant amount of white on the stencil brush. Tap the loaded brush onto a stack of absorbent paper towels. Too much paint on the brush can cause the paint to bleed under the stencil. Using light pressure, apply the paint to the stencil. heck to make sure all stencil openings have been covered and fill in where necessary. Remove the stencil and let dry. Continue stenciling randomly placed designs as desired; let dry. It’s Moroccan style x 3 when you stencil a trio of boxes with coordinated patterns. Use different intensities of the same blue hue for base coats and stenciled designs. We chose square paper maché boxes, but rectangular ones will also work. Free patterns are available at the bottom of the post! Basecoat the small and large boxes with two coats of pale blue, letting dry between coats. Base coat the edges of the small and large box lids with dark blue. Basecoat the medium size box with two coats of dark blue, letting dry between coats. Basecoat the edges of the medium box lid with medium blue. Use a fine-tip permanent marker to transfer all three designs to the stencil plastic. Tape the plastic in place onto the self-healing cutting mat. Use the crafts knife to cut out each design. Apply the stencils to all sides of each box and the top of each lid. Use stencil adhesive to secure stencils in place. Gently pat and smooth the stencil in place to ensure that all areas have adhered well. Pour a small amount of medium blue onto the disposable plate. Pick up a scant amount of paint on the stencil brush. Tap the loaded brush onto a stack of absorbent paper towels. Too much paint on the brush can cause the paint to bleed under the stencil. Using light pressure, apply the paint to the stencil. Check to make sure all stencil openings have been covered and fill in where necessary. Remove the stencil; let dry. automotive pin-striping tape in different widths to tape off stripes (which will remain clear) before spraying. 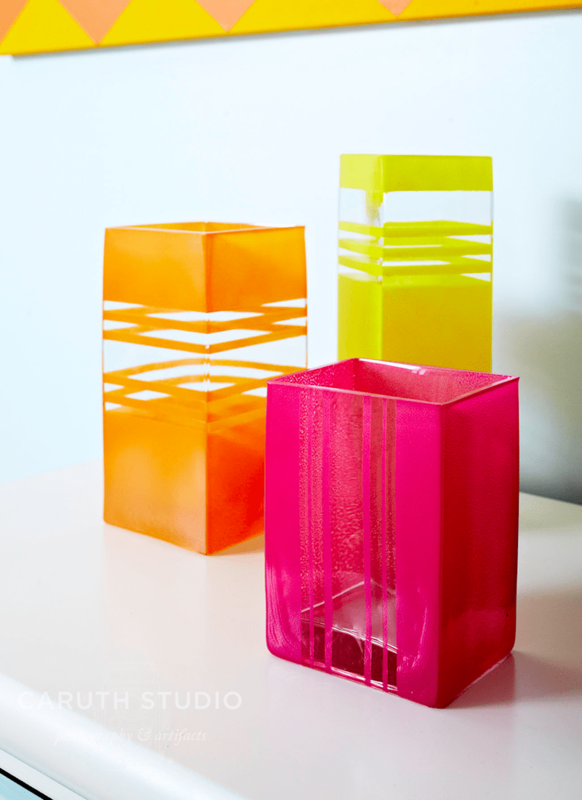 Apply lengths of automotive pin striping tape in the desired pattern on each vase. Following the manufacturer’s instructions, spray the vases; let dry. Make a jazzy artwork in no time with basic art supplies. 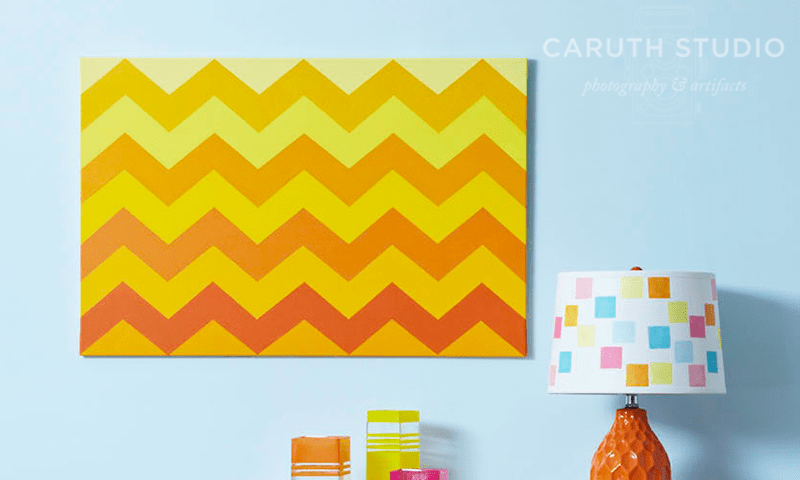 Tape off zigzag lines, then paint with foam rollers and acrylic crafts paint in multiple tones of yellow and orange. 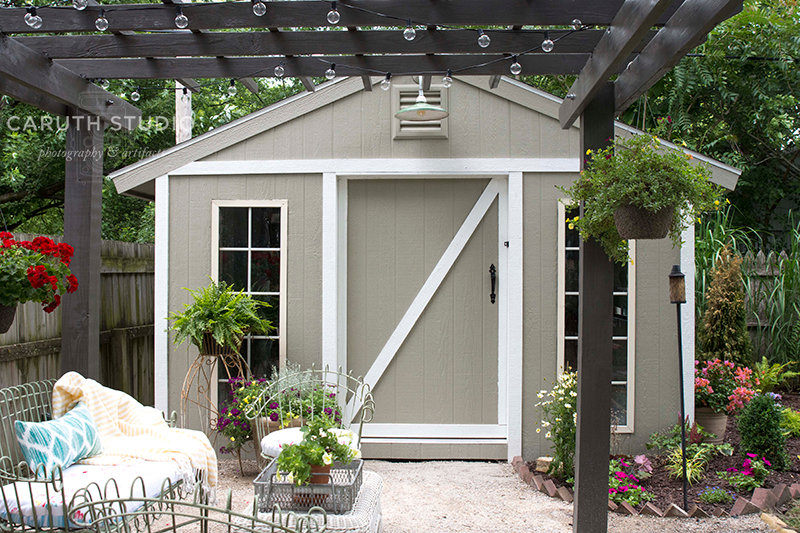 To do the layout, start by measuring and marking horizontal lines on the canvas 3″ apart. Next, make marks at 3 5/8″ intervals along each marked horizontal line and along the top and bottom edges of the canvas. To create the chevron pattern, start by drawing a diagonal line from the left-hand edge of the first horizontal line to the first mark at the top edge of the canvas. Next, draw a line from the first mark at the top edge of the canvas diagonally to the second mark from the left edge of the first horizontal line. Continue to draw rows of zigzag lines using the interval marks along the horizontal lines. 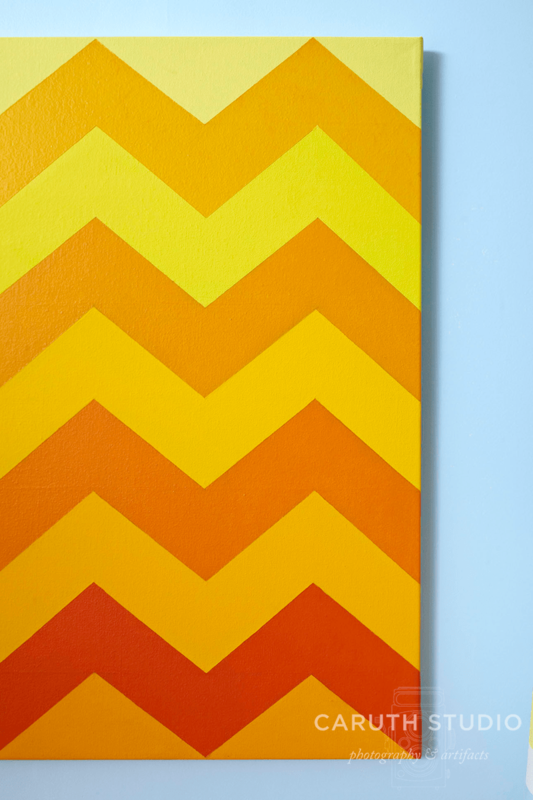 Use painter’s tape to tape off each chevron and paint with colors of choice; let dry. Apply two coats of finish sealer for protection. 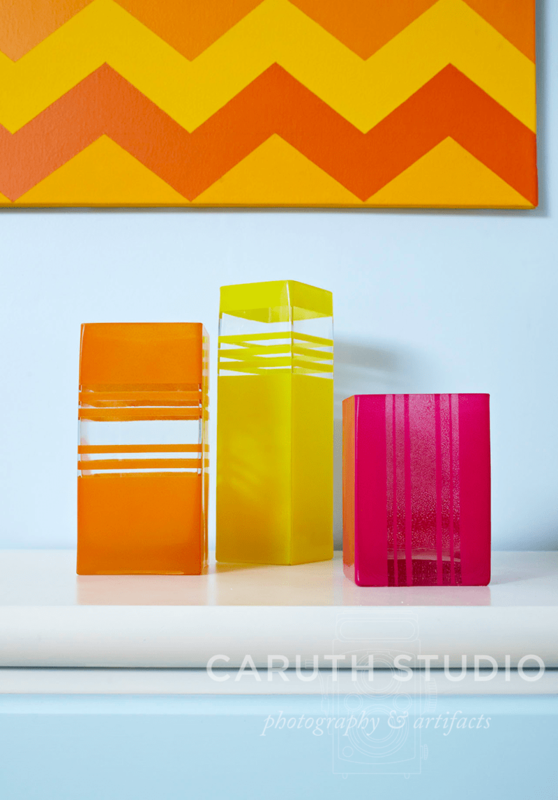 Get our free Stencil and Stamp Patterns for these easy painted accent pieces. Thanks! I agree—I’m in love with the happy color scheme.